In 2015, Enterprise Product Partners announced plans for a new pipeline that will run over 400 miles from Midland, Texas to Sealy, Texas. The yet-to-be-named pipeline will originate at Enterprise Product Partners’ trading and storage hub in Midland and will connect with the eighty mile Rancho II pipeline in Sealy. 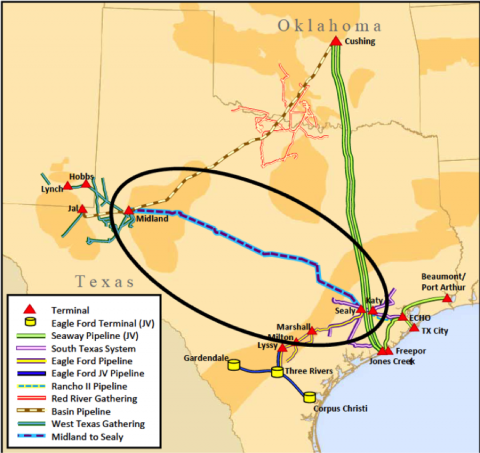 The Rancho II pipeline came on line in 2015 and will connect Sealy with the storage hub, the Enterprise Crude Houston Oil (“ECHO”) terminal, located in the southeast of Houston, Texas. The ECHO terminal was developed by Enterprise Product Partners in 2010 and functions as a central storage and distribution hub. The connection to ECHO will allow Enterprise Product Partners to access the Gulf of Mexico via Texas City. Enterprise is planning on continuing to take advantage of a recently passed exception to the 1970’s crude export ban by offering approved processed condensate at the Gulf. Currently Enterprise Product Partners is one of the most active condensate exporters in the region. The unnamed pipeline will have a capacity of 540 million barrels per day and is expected to come on line in the second quarter of 2017. The new pipeline will be capable of segregated transport and used to transport four different grades of crude: West Texas Sour, West Texas Intermediate, Light West Texas Intermediate, and condensate. The pipeline will be fed by both tanker trucks and pipelines that currently terminate at the Midland Hub. A map of the currently proposed pipeline which was presented in an Enterprise Product Partners presentation is shown to the right. If you live in one of the counties through which this pipeline will be installed, you may be getting a call from a land man representing Enterprise. Keep in mind that there are many legal and safety issues involved in having a pipeline installed across your property. In addition, there is no such thing as a “standard pipeline easement form”despite what the land man may tell you. You and your property are best served by seeking the input of an experienced Texas oil and gas pipeline attorney to assist you in evaluating the easement offer and in getting just compensation for the easement.